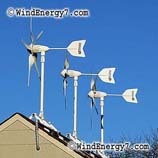 The rooftop home wind turbine kits have hybrid wind/solar technology. We invented the only rooftop turbine that’s safe and quiet for your home, certified to 130mph, and it is available for purchase online. 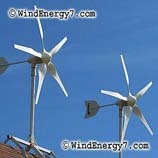 WindEnergy7 LLC is an Ohio based manufacturer of home wind turbine kits that are sold online. 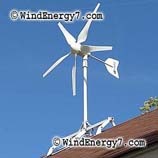 We hold patents for our inventions, home wind turbine kits that make rooftop wind possible. We have a growing dealer network of individuals in the US who use our products and an installed base stretching from Hawaii to Massachusetts. Many customers have found it easy to become customer/dealers with our wind turbine training. Our systems all qualify for the IRS 30% small wind tax credit which pays for 30% of your hardware and installation costs. Contact us for more information.